A Highly Effective Marketing Plan (HEMP) is a process that will dramatically improve your chances of profitably selling more of your products and services. And HEMP will stop you wasting thousands, maybe millions of pounds, dollars, euros or yen on marketing initiatives that should never see the light of day. HEMP is a straightforward, simple, 17 step plan which you can use to address your problems and opportunities whatever their size, whatever your business, whatever sector you operate in. And its tried, tested and proven. Each step is detailed within the book with explanations as to why each step is necessary. Also, the benefits of completing the process sequentially are highlighted. create a highly effective marketing plan that works  in just one hour! As Stephen Covey put it, "Begin with the end in mind." The principle of this step is: the greater the clarity of the outcome the more likely it will be accomplished. Step Two  Whats it worth? If youre going to do something then value it. And identifying a monetary value helps create a universal currency, as others might view differently the worth you attach to your project. For example, "this initiative will create turnover of £5 million and produce £1 million profit in 12 months" has a clarity which will appeal to any board or bank. Step Three  What are the consequences? All new plans have consequences. There are potential upsides and downsides  what are they? And what will be the consequence of not implementing your plan? This chapter explores how important it is to identify every possible outcome before the plan commences: often people will be more motivated by fear of loss than by the pleasure of gain, e.g. "consider what will happen if we dont pioneer this new initiative and our major competitor does instead." Who are we after? Who will be buying your product or service. And dont just go for standard classifications; really go to town gathering information. Build a picture of these people. How old are they? How much do they weigh on average? Would they prefer to fly British Airways or Virgin? When did they last go to the cinema and what film did they see? The principle of this chapter is that you cant know too much about your targets. Step Five  What do they currently think and do? Now you know who youre after, (step four), what do these people currently think about your product and service? And as a consequence of what they think, what do they do? Do they know you for providing one product and think thats all you do, (and as a result buy your other product from a competitor)? Have they never heard of your service or anything like it, (and therefore they currently do nothing)? Thinking precedes doing: know what your targets think. Step Six  What do you want them to think and do? Step Seven  Whats the story? What are you actually selling? This chapter prompts the exercise of succinctly writing down exactly whats on offer. This exercise is amazing for many people who whilst believing they know what they do actually discover that either they dont or they cant adequately describe it. All too often peoples description of their service or product are boring and confusing filled with far too much irrelevant detail. This chapter distills down to the ONE big thing on offer. This chapter is what Pearson calls "The 10 second sell", and you know how effective that is. Step Nine  Whats the benefit? This step looks at the one big thing and asks the question: so what? What do you do for the target customer? Does this benefit them significantly? Is it compelling and how does it compare to the competition? Is your current personality appropriate for the product or service youre offering? Theres no point your being seen as British Airways if your product is designed for Virgin customers. Theres a built in disadvantage, which is unnecessary, for a traditional old-fashioned company offering a service which will primarily appeal to youth. This step asks the question: do you need to review the personality of your company for this new product or service to work? There are lots of examples of how companies have successfully changed to inspire readers; for example Gieves & Hawkes, Burberry, FCUK in the fashion industry; Tesco in food retailing and Swatch watches. Step Eleven  How will you talk to your targets? We explore the different communication methods and mediums which can be used singularly or more often than not are combined for maximum impact. The real life examples of marketing excellence, which are highlighted throughout the book, deliberately draw on a variety of mediums including: poster, TV, radio, press, direct mail, PR, ambient, viral email, etc. Some honest insider truths about the effectiveness or otherwise of certain media will be revealed. Step Twelve  How much? Whats your budget? Compare this with the numbers written down in step two: is it realistic? Compare this with the ideas youve got from step eleven: is it realistic? If not then some rethinking is required. Its not just money. Your plan will need other resources, people, equipment and time. Identify all of these at the beginning, not on the hoof, and get commitment from others who are vital for helping achieve the desired result. How much of your time will the plan take up? What will you stop doing or give up to create the time for this plan? According to Tom Peters, "if you cant measure it you cant manage it"  too right. Therefore identify at the outset the measurements which will tell you that youre on the right track. Sometimes these can be unusual ones which might be more revealing than numbers alone, for example Your Mother Should Know is a process some companies can use: every employee asks their mother if theyve heard of the xyz product, or seen the latest advertisement and measures the response. The same apparently random yet amazingly revealing technique works when consulting employees children and their friends about a service geared to that age group. Step Fifteen  What next? This is where we get readers to make a written commitment to take the next actions. What are the ten most important things that are needed to be done first? These can be large or small. Step sixteen  Whats your name? The best plans often have a name. This ensures that everyone knows what the meeting is about when they see the ABC Plan on the agenda. Choose a name which really motivates. At the end of the book I will include tips for successful implementation of HEMP based on hundreds of real case studies. Throughout the book are real case studies and examples including great photographs, pictures, graphs and evidence of people making lots of money and having huge success thanks to HEMP. HEMP is proven  over 300 companies have used HEMP and found it to be highly effective, indeed several people have gone on record to state that as a consequence of HEMP theyve made £ millions. HEMP is very practical. Its a step by step process without any marketing-speak or jargon, indeed it includes a 10 second sell (and we know how effective that is). HEMP can be used by small start up companies and multinationals alike. HEMP is for marketing people, and non-marketing people; chief executives and new people looking to get on; everyone in business can use HEMP. Perfect core business seller  this is to marketing what Sold! is to selling. Peter Knight has run small, medium and large companies and today is Founder & Chairman of Phoenix plc, a marketing communications agency which works with clients including Motorola, First Choice, Laing, Harry Ramsden’s and many more. Phoenix employs 60 people at The Chapel of Ideas – a converted church – all of whom are engaged in effective communications via all media. Peter is a TEC International speaker and won the speaker of the year award in 2002. He regularly is engaged by clients to speak and facilitate at conferences, business retreats & strategy planning workshops, and he also contributes to several trade publications. 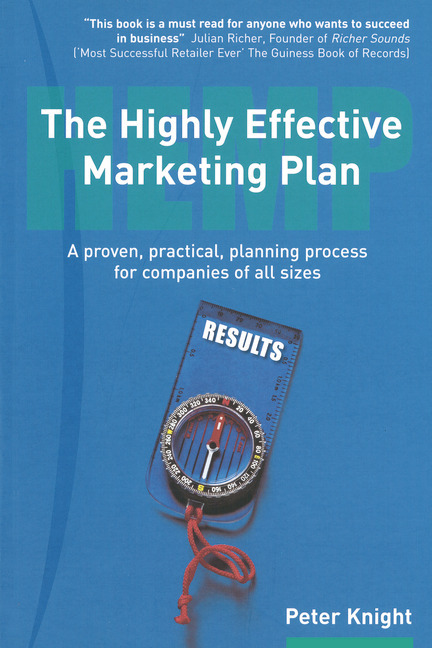 "Startling both in its simplicity and effectiveness, I hugely recommend HEMP as essential reading for anyone involved in or interested by marketing." " HEMP helps you achieve in a few hours a plan which would normally take weeks"
HEMP will stimulate you to look at marketing challenges with enhanced clarity and significantly increase your chances of delivering demonstratable value. Plus, it's a really entertaining read!" "Clear, concise and informative - focused on the key issues, avoiding all the jargon!" Have you got a Highly Effective Marketing Plan?